Being a geeky type of chap, I generally find that the best way to guarantee that Santa puts a decent geek-friendly Christmas present in my stocking is to buy it myself! So this year I treated myself to an Icom IC-R20 hand-held, all-band communications receiver/scanner. Miscellany of Chinese-manufactured Kaide & Kchibo shortwave receivers I picked up cheaply in various Hong Kong street markets. But I must say the Icom IC-R20 is definitely the king of the heap. And it has to be one of the best-looking hand-helds ever made. I have left the deeply technical stuff to others. Please see the section marked Icom IC-R20 reviews on-line further down the page. Suffice it to say that I find it offers a performance and an overall build-quality, roughly on a par with my trusty AOR 8200. The display and the battery life is better on the Icom IC-R20 than the AOR 8200. The sound recorder in the IC-R20 is handy - albeit rather limited. Downside is that the Icom IC-R20 is picky about its power supply, insisting on 6 VDC. Whereas the AOR will use a standard 12 VDC power supply. Actually the AOR 8200 seems happy with anything between about 8 & 13 volts. A well engineered and compact unit, the IC-R20 is a pleasure to use. Its frequency coverage spans from 150 kHz up to 3300 MHz, uninterrupted (unless you live in the United States - where the US version is hobbled so it cannot receive mobile phone frequencies). Battery life using the supplied battery pack is around 10 hours. And you can use ordinary alkaline R6 (AA) batteries when the battery pack runs out - providing you remember to bring the little R6-battery adapter with you! Or you can splash out and spend £40 on a spare battery pack. The controls are well placed, well spaced and relatively easy to use - though it is worthwhile actually reading the manual because quite a lot of additional funtionality is not immediately apparent. For example you can swap the tuning and volume controls around! The variable bandwidth bandscope is handy for detecting signals near to the one you are receiving and its variety of scan modes seem very comprehensive indeed. The LCD display is clear and the efficient backlighting makes it very usable in low-light conditions. The set is reasonably sensitive, though one makes compromises for its small size - as one does with all hand held communication receivers. The sound quality from the IC-R20 is reasonably good. It is no noisier than the AOR 8200. And the built-in speaker is reasonable considering its small size. The set is 60(W)×142(H)×34.8(D) mm and weighs just 320 grams including battery pack and the supplied telescopic aerial. One of its endearing features is that its computer connectivity lead is a standard A to mini-B USB lead, rather than some horribly expensive proprietary lash-up as used by AOR. It is the same lead as used by my Fuji S9600 camera, my Sandisk card reader, my Edirol R-09 digital sound recorder and my IcyBox USB hard disk drives. It is great only having to bring one lead with me - and knowing I can replace it for a few quid when I loose or break it! Connect the Edirol R-09 reciorder with a stereo 3.5mm male to 3.5mm male lead with a stereo to mono adaptor at the IC-R20 end. I usually record in pure 16 bit WAV format on the R-09. Then I can easily transfer these to any PC (or MACor Linux box) either via the USB lead or by removing the Edirol's SD chip and using a card reader. "Top and tail" them using Soundforge 4.0 - also running perfectly under Linux. You can also use noise reduction plugins at this stage if you have them. Encode the resulting files as MP3 using open source LAME encoder. I generally use the KDE SoundKonverter front-end on my Kubuntu Linux boxes. Windoze users can use something like Audiograbber. 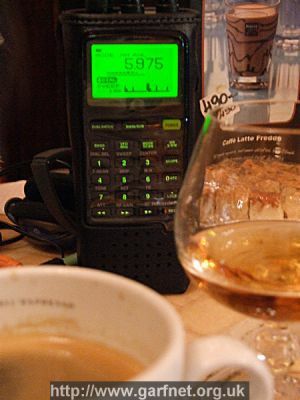 As other reviewers have commented, the IC-R20 could do with better selectivity, both on HF AM and on VHF WFM. One should not expect the same channel on two, four or sometimes even six adjacent frequencies. Granted, judicious use of its menu-embedded RF gain control can negate this to some extent on strong signals. But selectable bandwidth would be a much better way methinks. Why does Icom (and most other manufacturers) still use those yukky coloured yellowy-green backlight LED's when white LEDs have been adopted by mobile phone manufacturers' displays for many years? She-that-must-be-obeyed describes it as "looking like a 100 year old mobile phone!" Granted, the display on the IC R20 is much clearer than most other devices in its class. But c'mon Icom, it is the 21st century! However I think it is the sound recorder that everyone else seems to rave about that has annoyed me most of all. Whilst I accept that it is a very nice feature, I feel it could have been done so much better. For example, as an opensource guy, I find it deeply irritating that Icom chose an obscure proprietary format for its sound files, when it could have used MP3 or the open source and 100% free OGG format. SD Chip. Whilst 32MB of storage for the audio recorder is a heck of a lot more than you get with the AOR 8200's add-on, it is pathetic by today's standards. 1GB SD chips now retail for under a tenner! IC-R20 boasts four hour's recording in the "Long Time" mode. However, the only recording mode worth using is "Fine" because both the "Long Time" and "Normal" modes add unpleasant audible artefacts to the recording. "Fine" mode gives you around 1 hour recording time - which gets gobbled up very quickly, in my experience. A removable SD chip using standard MP3 files would seem a much more sensible, cost-effective and generally useful way to store audio IMHO. Use SD chip for.icf files. With a little more imagination, the IC-R20's .icf file(s) could also have been stored on the same SD chip - making cross-platform compatibility much easier to achieve. Stereo 3.5mm jack, why do so many scanner manufacturers still use a mono 3.5mm jack when almost all headphones now use a stereo 3.5mm jack? It means that you either only hear sound through the left headphone speaker or you have to buy some crappy, overpriced mono earpiece! Icom want five quid for theirs and it really is awful! Alternatively, you can buy an additional stereo to mono adaptor. Whilst these adaptors are not expensive, they are easily lost and they protrude excessively from the side of the scanner. Consequently, the scanner phone jack can easily be damaged. Besides it makes a very pretty scanner look damned ugly too! Clock. I have bought cheapie (sub £10) shortwave sets in Hong Kong street markets that have basic timer functions - so why is this lacking on the IC-R20? Metadata and log files. Being familiar with digital recorders such as the Roland Edirol, I find it very irritating that the Icom IC-R20 does not capture essential metadata when making a sound recording - such as the date and time the recording was made and ideally the frequency and the mode of the transmission. This is very basic stuff and would cost Icom nothing - or next to nothing - to implement. Had Icom used MP3 or OGG as its soundfile format, this metadata could be written in plain text to the soundfile's ID3 tags. And the software to do it is all open source and again would cost Icom nothing. It really is a pain having to write down this information separately every time I make a recording! In any event, if the device had an SD chip it would be dead easy to store log files on it. Just imagine that! PS. It is probably worth the extra £15.00 for the Icom LC-158 soft case to protect the large and rather easily scratched LCD screen. Bob Parnass's software site. He has written a number of scanner control packages for Icom and Yaesu scanners and his stuff does run on Linux. No softs for the IC-R20 yet though.